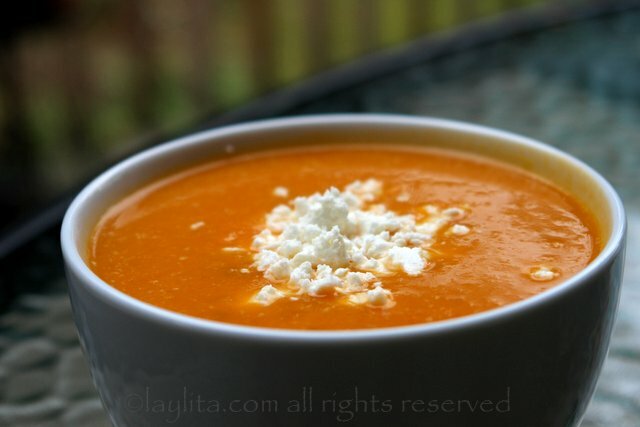 This is my super easy recipe for sopa de zapallo, a delicious homemade pumpkin or squash soup made with squash, onions, garlic, cumin, tomatoes and chicken or vegetable stock. Served with queso freso, feta or goat cheese, and chives. 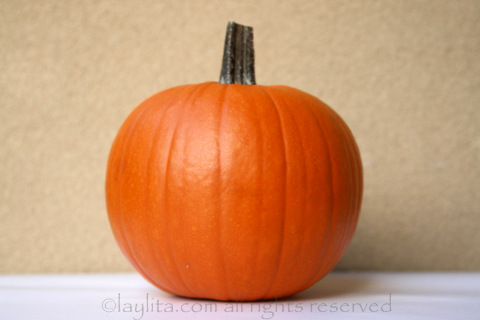 This pumpkin or squash soup, sopa de zapallo or calabaza in Spanish, is perfect for the cold winter days, or any rainy day. This comforting soup could also be called a squash and tomato soup, I love to use tomatoes to help neutralize the sweetness of the squash. 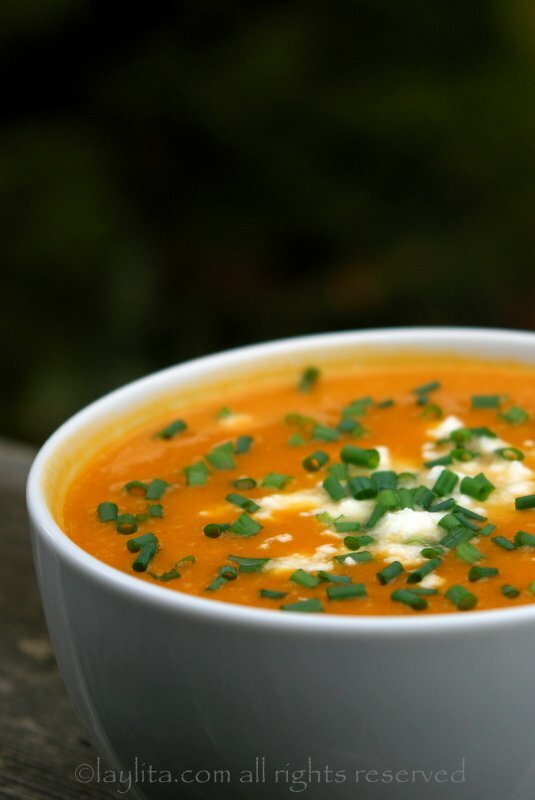 Personally, I find that pure pumpkin or squash soups can be too sweet for my taste and the tomatoes add the right amount of acidity to balance it out. 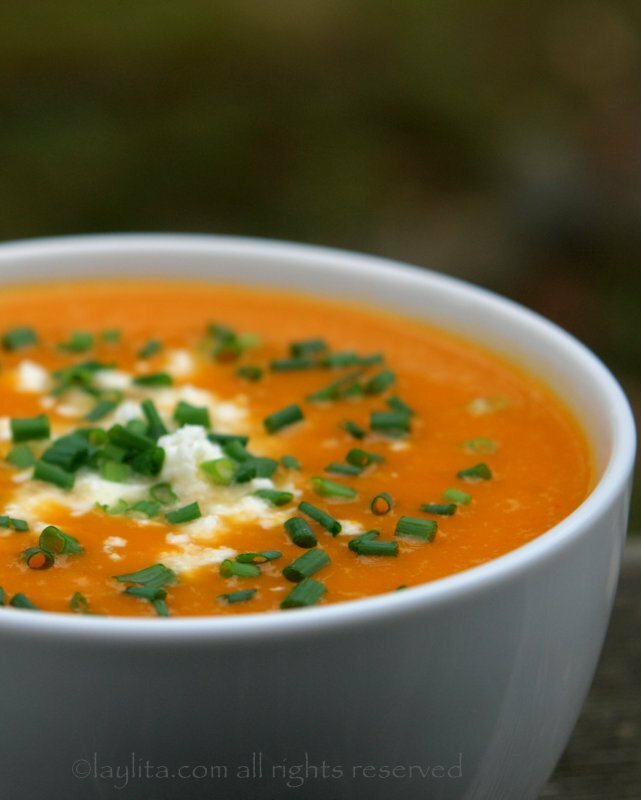 You can use any type of squash to make this soup, I use pumpkins when they’re in season (which doesn’t seem to be too long). Butternut squash is much easier to find and tends to available for most of the fall and winter so it’s a great squash to use for this sopa de zapallo recipe. 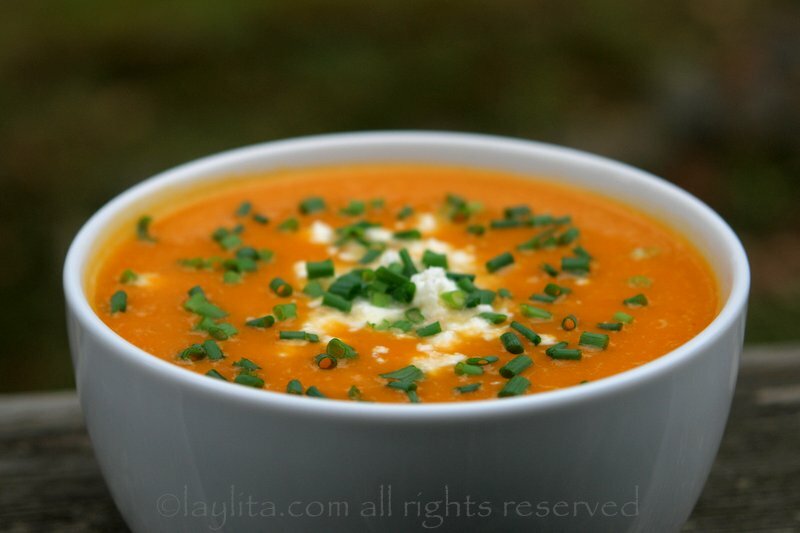 Easy recipe for sopa de zapallo, a delicious homemade pumpkin or squash soup made with squash, onions, garlic, cumin, tomatoes and chicken or vegetable stock. Served with queso freso, feta or goat cheese, and chives. Heat the oil over medium low heat in a large saucepan or soup pot. Add the onion, garlic, cumin, and tomatoes, sauté until the onions are translucent or about 5 minutes. Add the 6 cups of chicken or vegetable stock and bring to a boil. 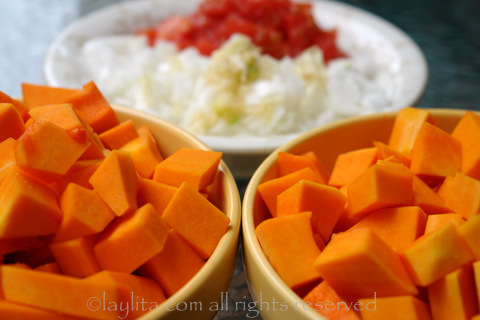 Add the squash chunks, bring to a boil, reduce the heat and simmer until the squash is very soft, about 30 minutes. Let the soup cool down enough to blend to obtain a puree, you will probably need to work in batches or use a handheld immersion blender. Add salt and pepper to taste, re-warm if necessary. Serve warm with queso fresco, feta or goat cheese and chopped chives. Can also serve with avocado slices. This sopa de zapallo is very easy to make, and uses only a few simple ingredients: onions, garlic, cumin, tomatoes, and chicken stock (use vegetable stock for a vegetarian option). 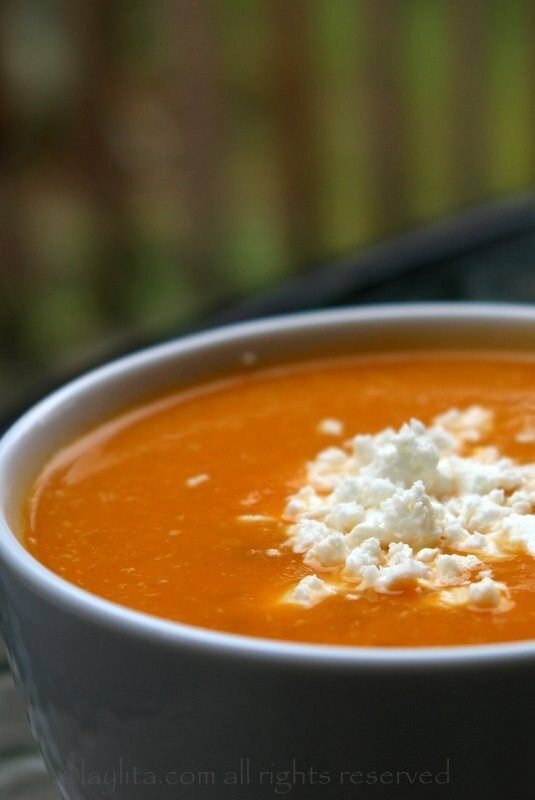 I like to serve this squash soup with queso fresco, feta or goat cheese are also great options. 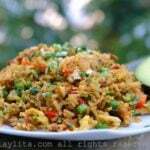 I also love to serve it with avocado slices on the side and chopped chives or green onions sprinkled on top. This soup is so delicious! 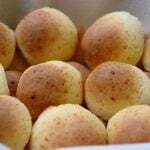 Thank you for this recipe and the one for locro de papa, which is out of this world! 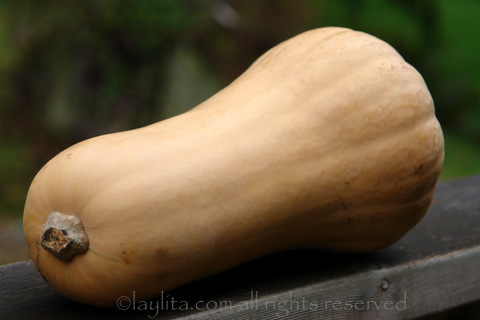 To save time, the zapallo/squash can be microwaved vs simmering for 30 minutes. 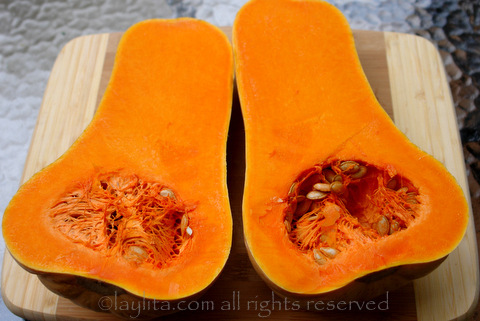 Cut the zapallo/squash in 1/2 or into 1/4s, removing seeds with a tablespoon. Place in a glass pie or small glass cake pan. Cover with microwaveable plastic wrap, then microwave until fork tender. Time will depend on your microwave. 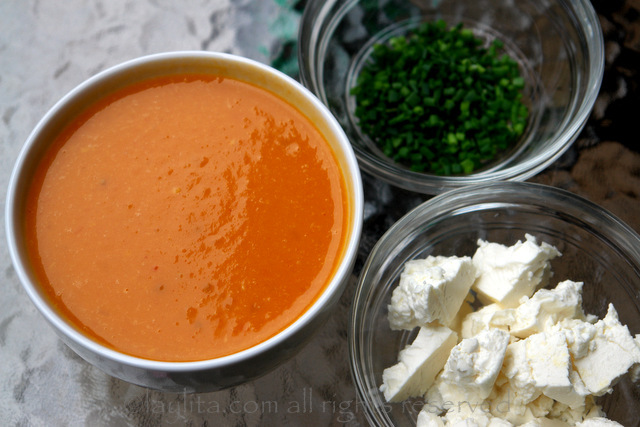 Let it cool just enough to safely puree it in a food processor or blender before adding it to the soup base.